This post follows the theme of my previous one. My boss pays a lot of attention to the citations that are read out while presenting an award. Very often, the team receives citation that goes into excruciating details of the task performed by an individual. The appreciation gets lost in the details. And then one day our client came to present an award. He opened with words like ‘outstanding’, ‘astonished’, ‘amazed’ and ‘proud’. Once these words were out there, the details didn’t really matter. The opening line alone had conveyed that the individual had performed well. The intention is not to inspire someone to match the exact skills but to work in a way that will inspire someone to talk about your word using those adjectives. 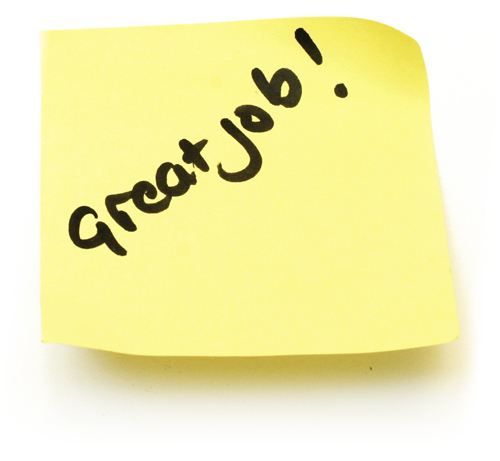 Details can always follow, but sometimes just saying ‘Good job!’ can work magic. Do you always have a lot of trouble trying to define why you want to appreciate someone? Just tell them that they’ve done a brilliant job and watch them break into a smile.